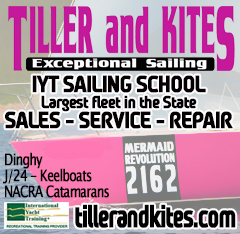 The 2017 TSC sail class was a resounding success. Thirty seven people attended the evening classes, the success of which was due in no small part to Mike Mulcahy, who handled the applications, taught some of the lessons with me & helped arrange parts the power point presentations. Thirty students showed up at the lake – eventually. We arrived at the lake, Saturday morning 1/2 hour before our first students were supposed to arrive only to find about 400 people there for a run around the lake event. Cars were parked all the way to Silverbell Road. & a band stand was blocking the launch ramp. Although not planned we fortunately we were able to reschedule those students into the next day. Catherine Westerband’s doughnuts helped ease the stress of that 1st hour. Thanks to our Saturday instructors, Glen Brostedt, John Callor, & Miguel Guzman. Special thanks to Rick & Gay George for their tireless help both days as well as Keven Walker & commodore Marshall who also put in two 12 hour days. Paul Bear & Trent also helped and lastly Patrick O’Kane, who is not even a member put in over 12 hours. At least 8 students have filled out applications to join the club. I hope club members will make an effort to introduce themselvesto these folks and make them feel welcome at our next meeting. 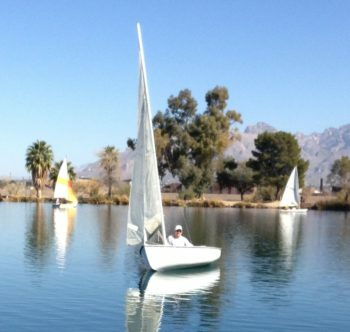 So if you would like to learn how to maneuver a sailboat, you are an excellent candidate for Beginning Sailing Lessons. 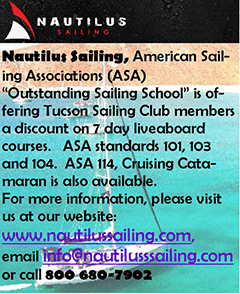 Knowledgeable and experienced Tucson Sailing Club members will prepare you to take your maiden voyage, with both classroom and hands-on instruction. Fair winds! (c) emt/dk. All rights reserved.